The song is all about the rescue of six Irishmen who were imprisoned by The British in Western Australia. The men had been sent there because they were Fenians who were fighting for Irish freedom in Ireland. In 1876 these men escaped on board the ship The Catalpa. James Reynolds who was a member of Clan na Gael who were friends of The Finians bought the Ship Catalpa for a sum of $5,200. On the 29 April 1975 the ship set sail from Massachusetts. The twenty two member crew were unaware of were they were even going, this information was kept secret. While the ship was on it's way to Australia two Finians had already arrived there to help plan the escape, the two who arrived were masqueraded as American businessmen. They were John Breslin and Tom Desmond. Several attempts were made to drop anchor but some royal navy ships were hanging around the harbour. The Catalpa then decided it was to risky for such a large ship to sail inti the harbour so they sent a small whaleboad to the shore. At 6-30 am six Finians escaped over the prison walls, they were, Thomas Darragh, Martin Hogan, Michael Harrington, Thomas Hassett, Robert Cranston and James Wilson. At this stage of the escape the prison authorities were searching for the escaped prisoners. The British navy attempted to stop The Catalpa by firing a warning shot. Captain Antohony of The Catalpa then raised The American Flag and informed the Georgette [British Navy Ship] that an attack on the Catalpa would be considered an act of war against the USA, and proceeded. The Georgette followed until they ran out of fuel. 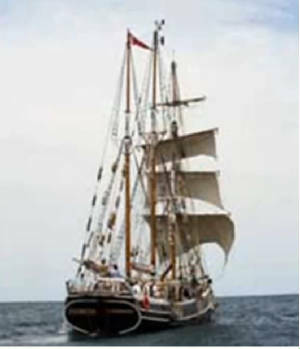 The Catalpa sailed into New York Harbour on the 19 August where a hugh crowd had gathered to cheer.